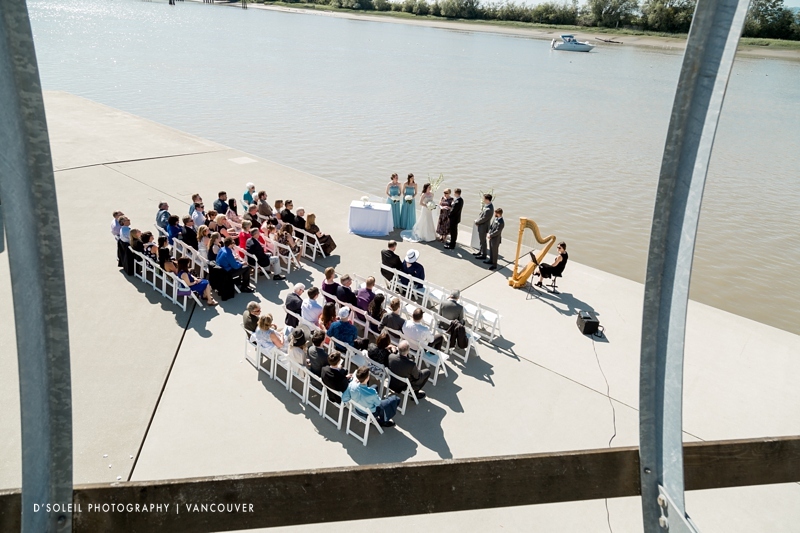 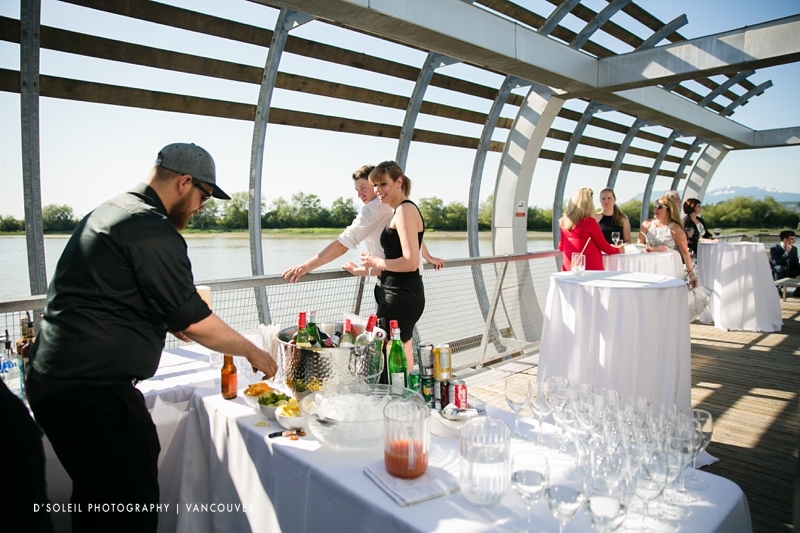 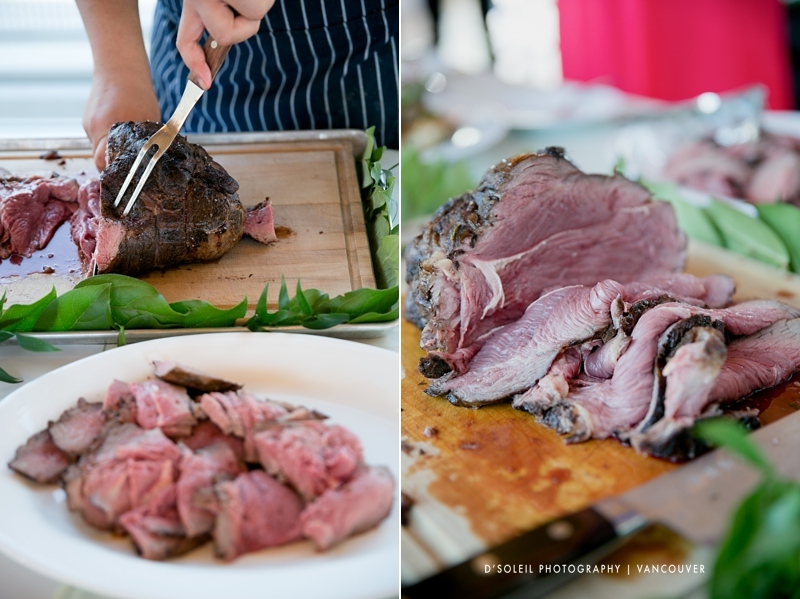 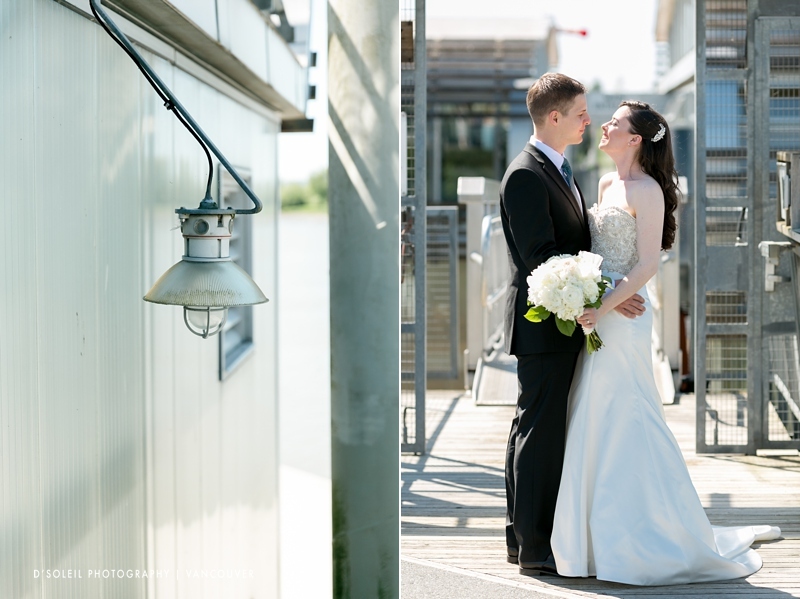 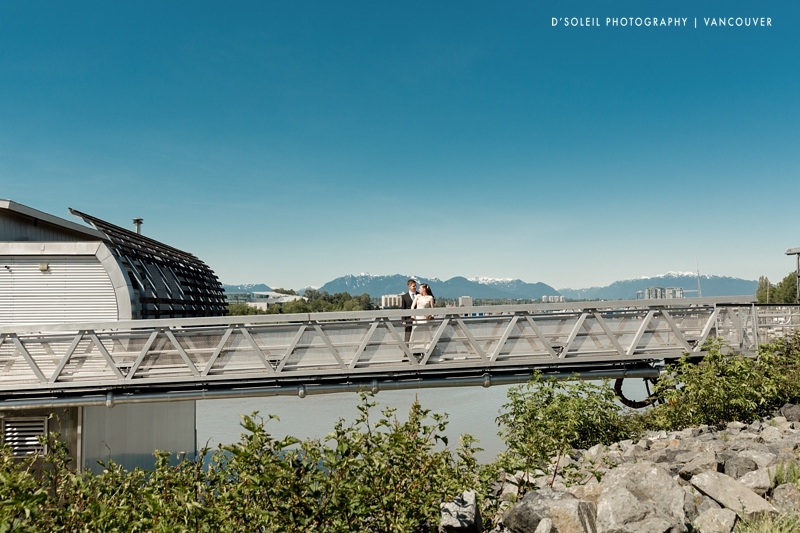 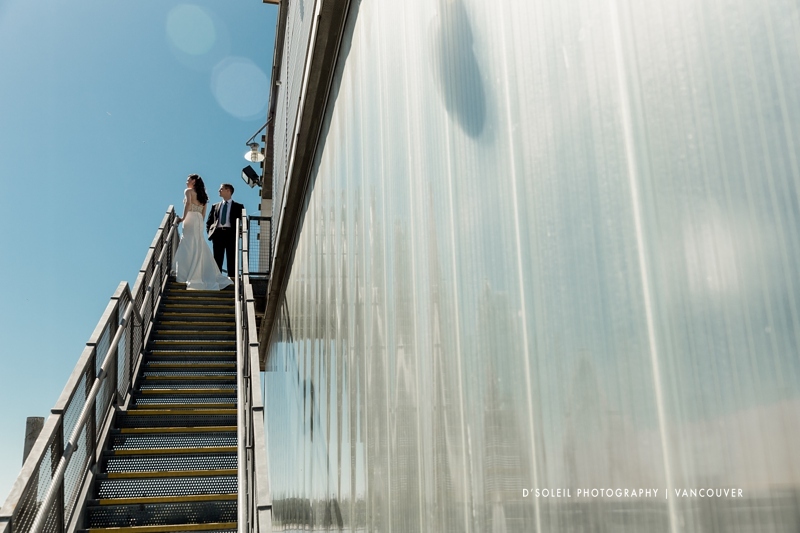 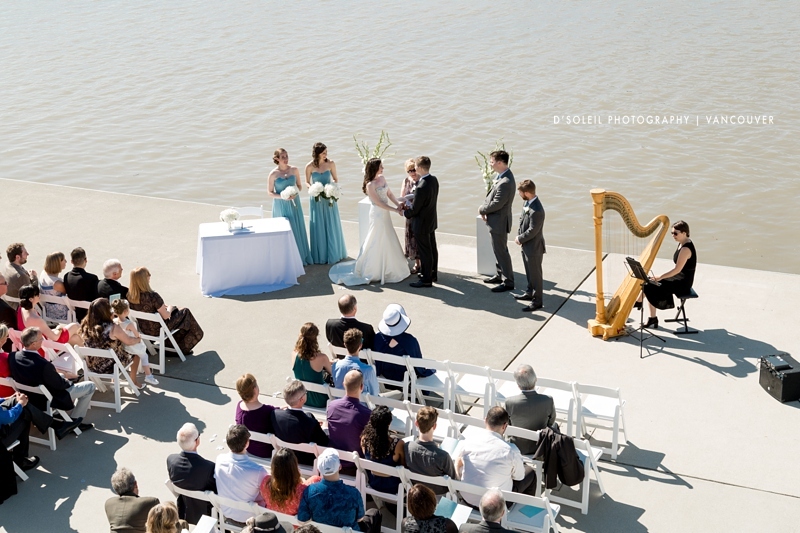 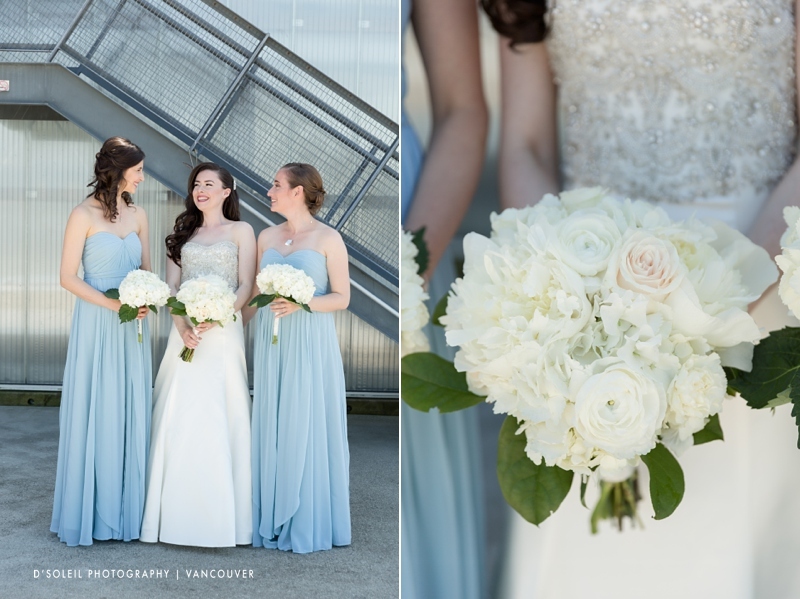 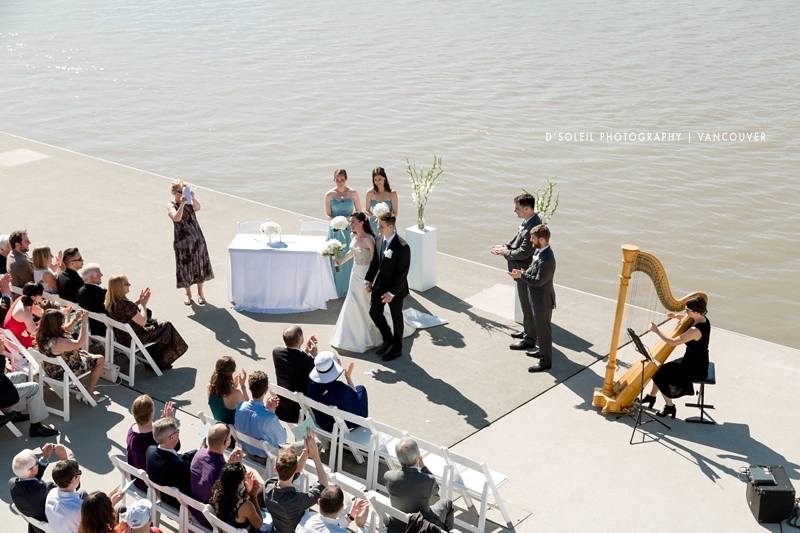 An outdoor wedding at the UBC Boathouse in Richmond, BC is one of the most special sorts of outdoor weddings in Vancouver you can host. 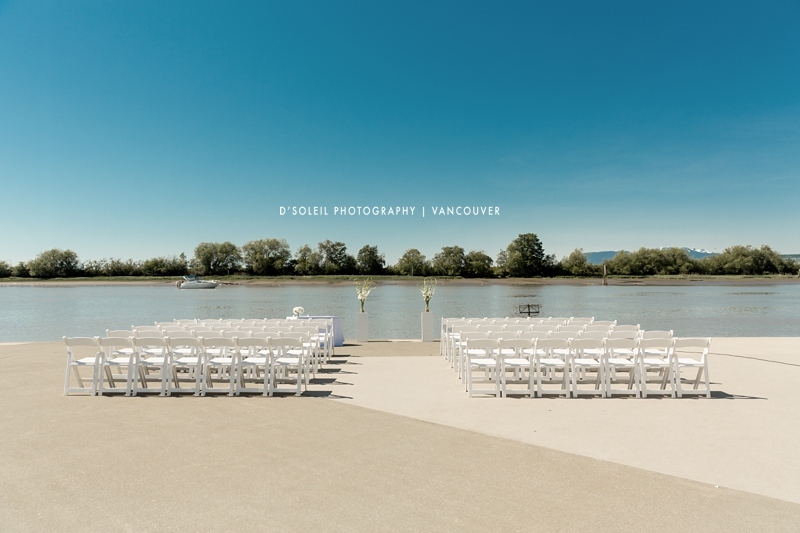 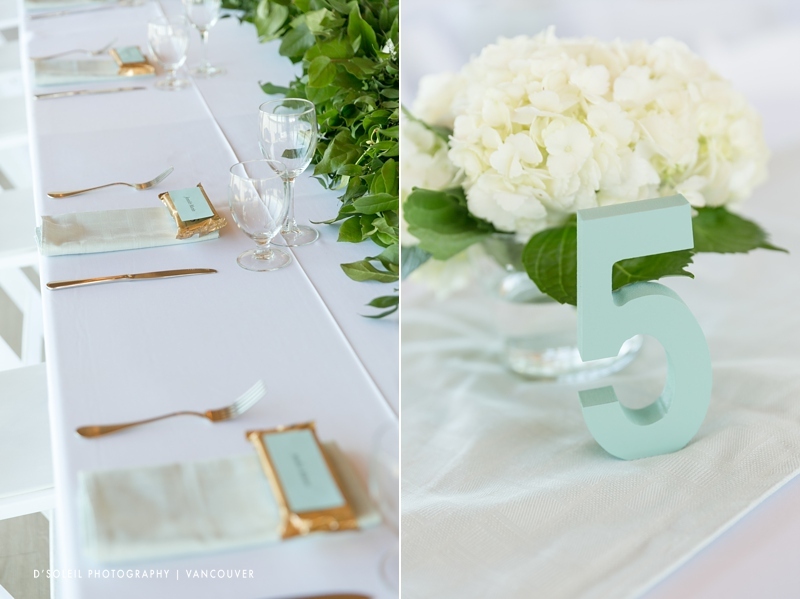 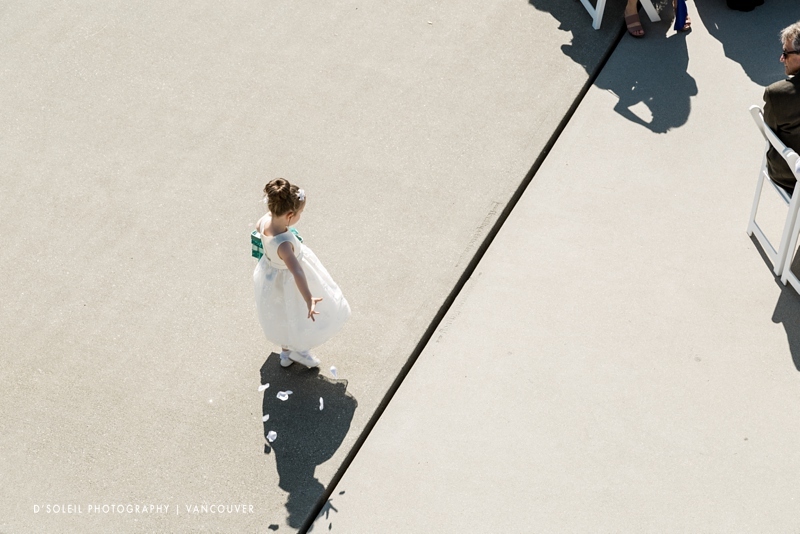 On a warm Spring or Summer day in Vancouver, weddings at the John M.S. 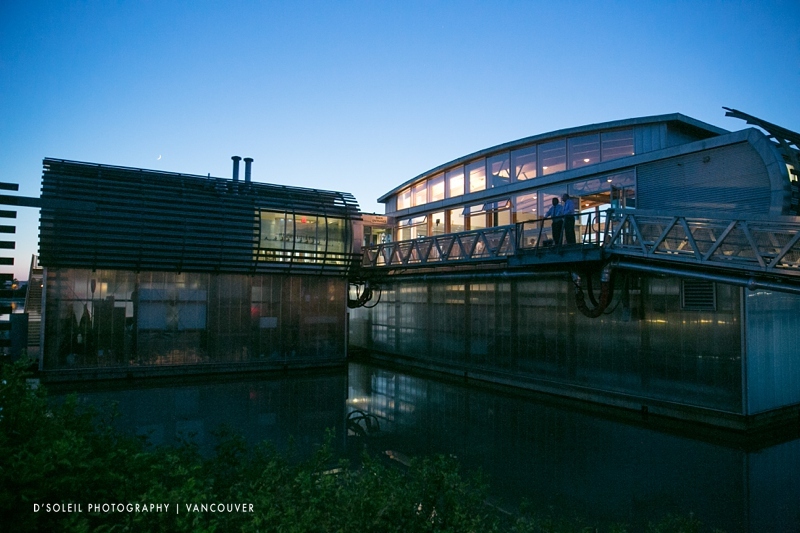 Lecky UBC Boathouse transport you to another place. 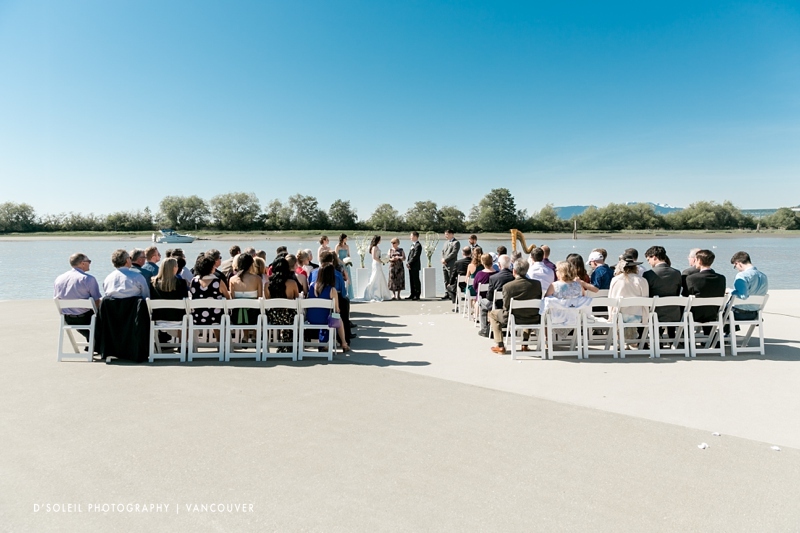 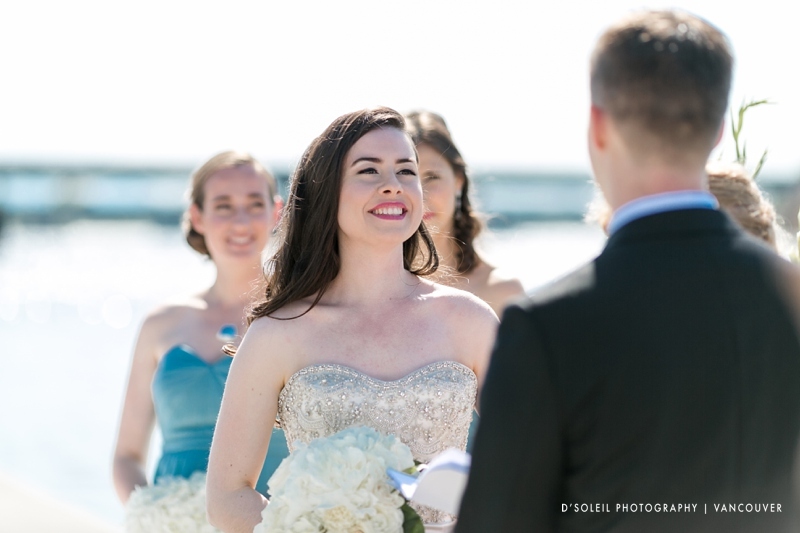 As you watch two beautiful people like Erika + Shane commit their vows to each other, you are surrounded by beautiful blue skies, tranquil waters, and snowcapped mountains in the distance, as planes pass overhead, with visitors witnessing your special event from above. 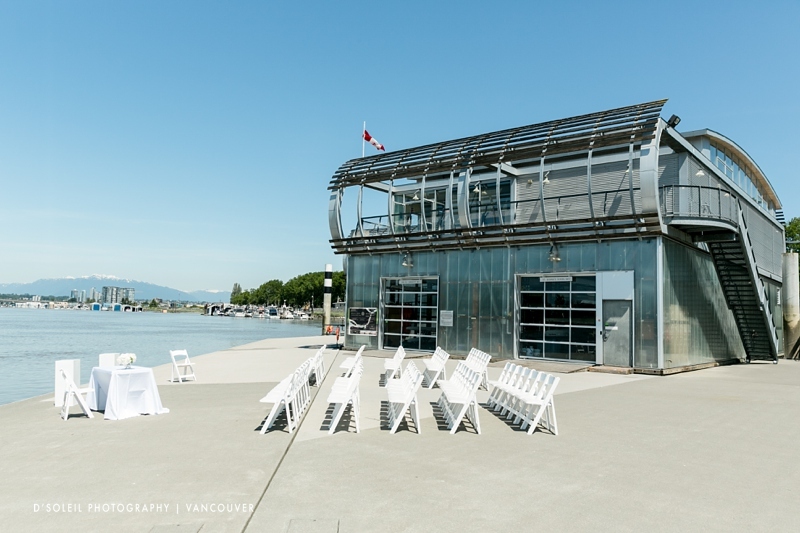 On this beautiful spring day, a gentle breeze set the wedding venue at the perfect temperature for an outdoor wedding at the UBC Boathouse. 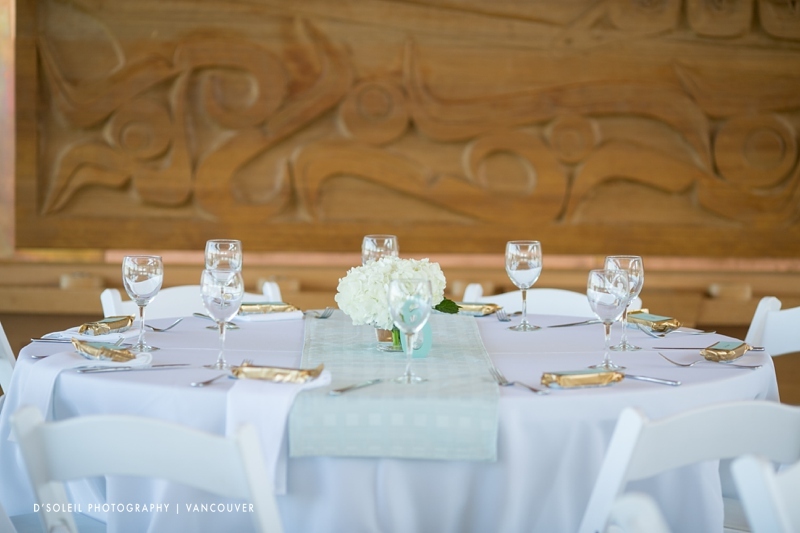 Indoors, their friends and family help to set up the West Coast themed event space for their wedding reception later that evening. 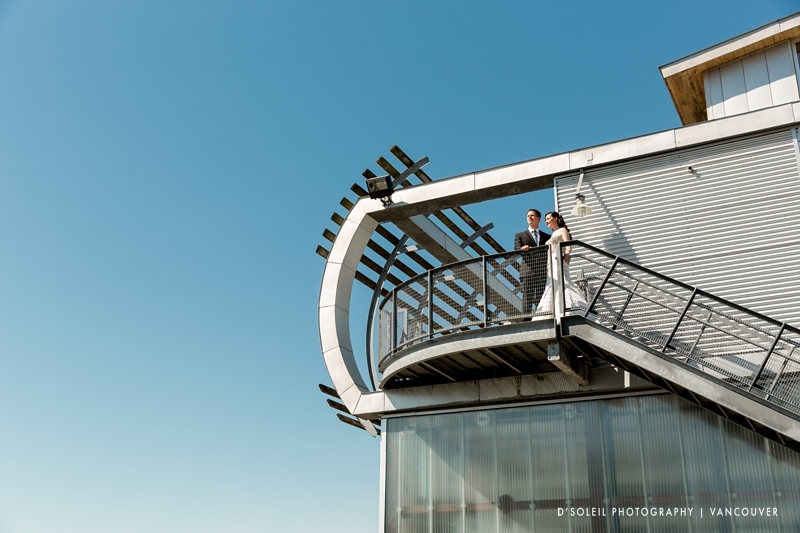 Before their ceremony, the bride and groom took photos around the venue, keeping close-by for a stress-free afternoon. 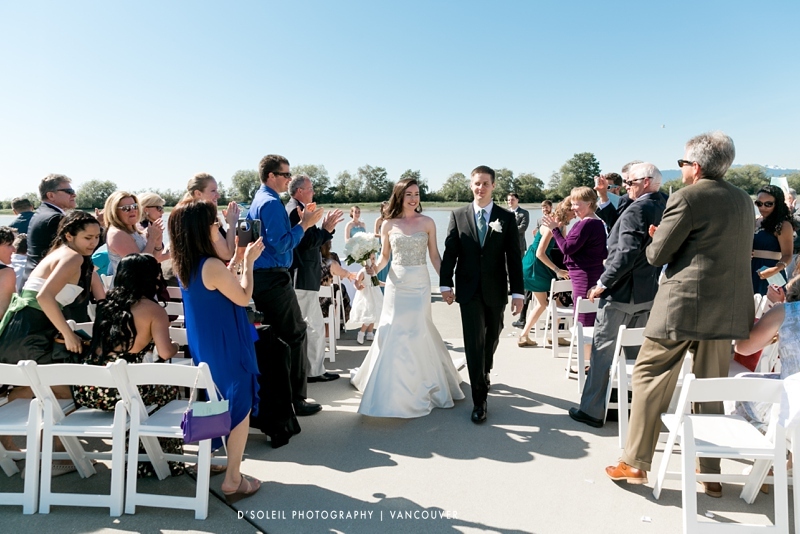 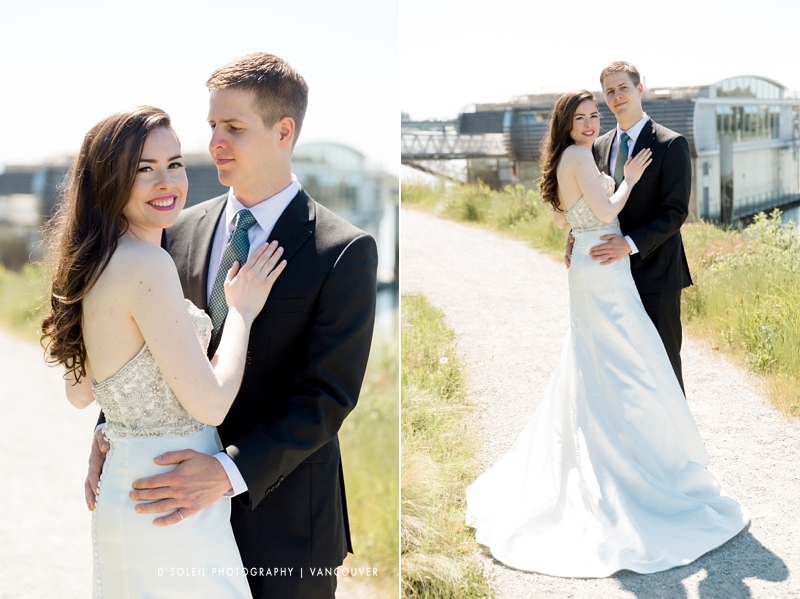 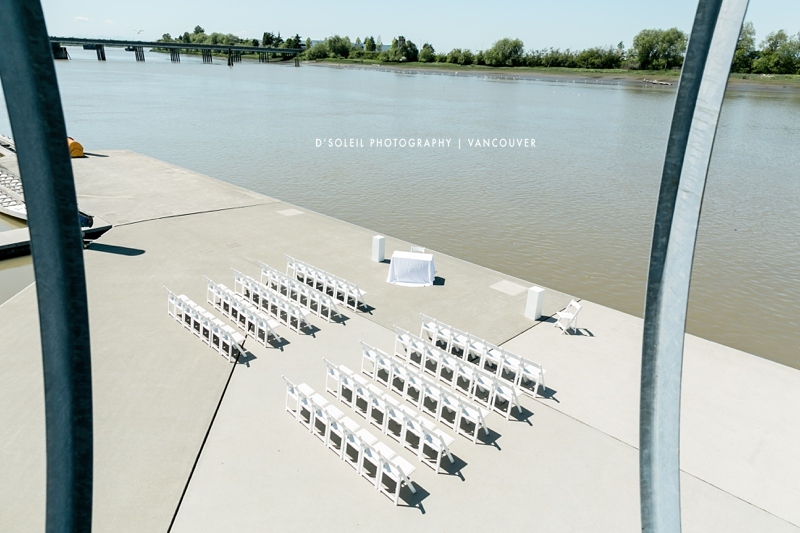 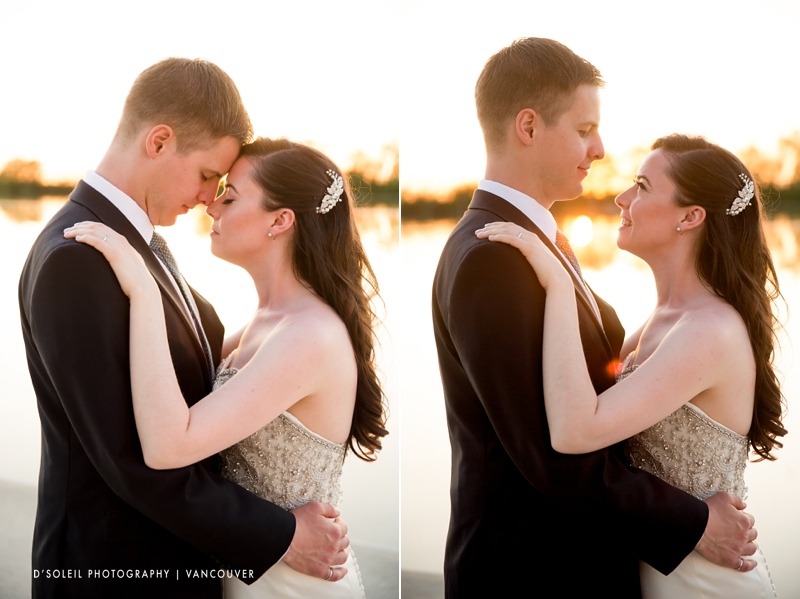 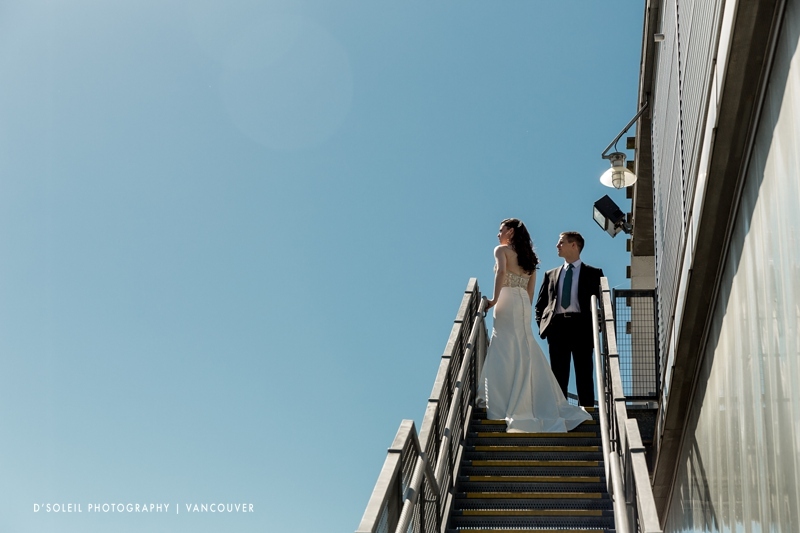 After their first look, we took photos on the boat deck and around the Richmond dike next to the Fraser River. 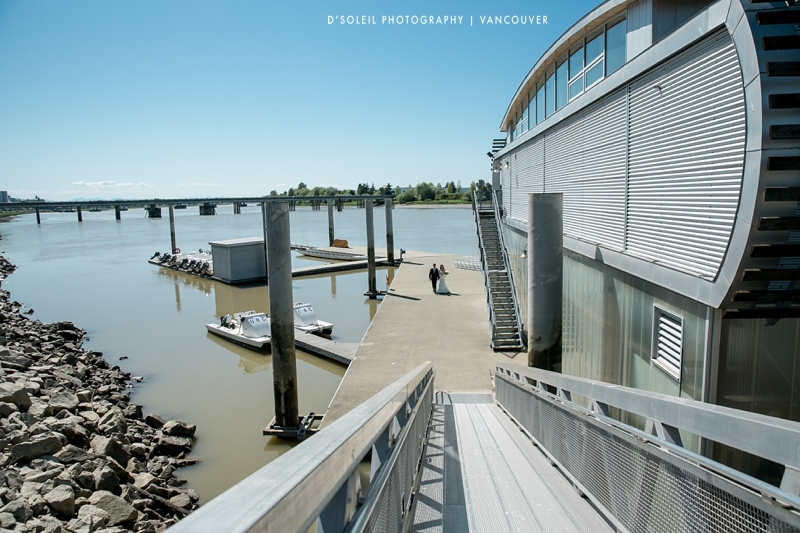 I love how the UBC Boathouse contrasts with the blue sky. 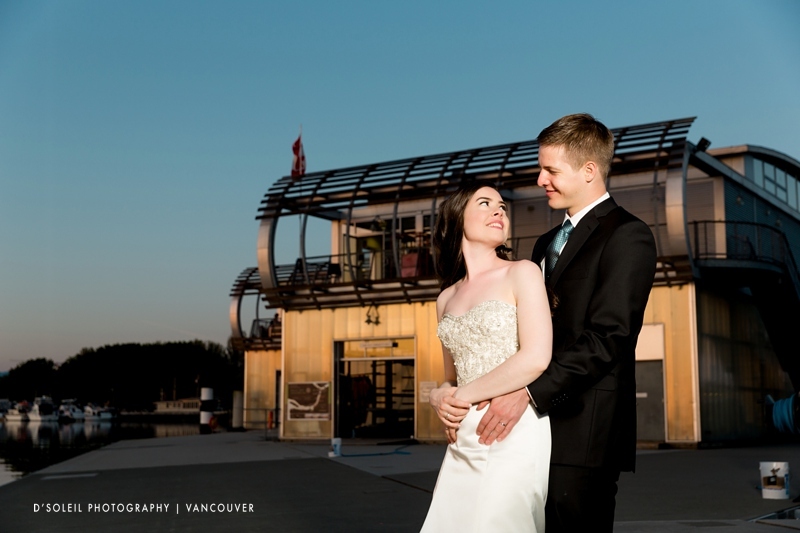 The nautical feel of the floating venue is a dream for those who love being on the water. 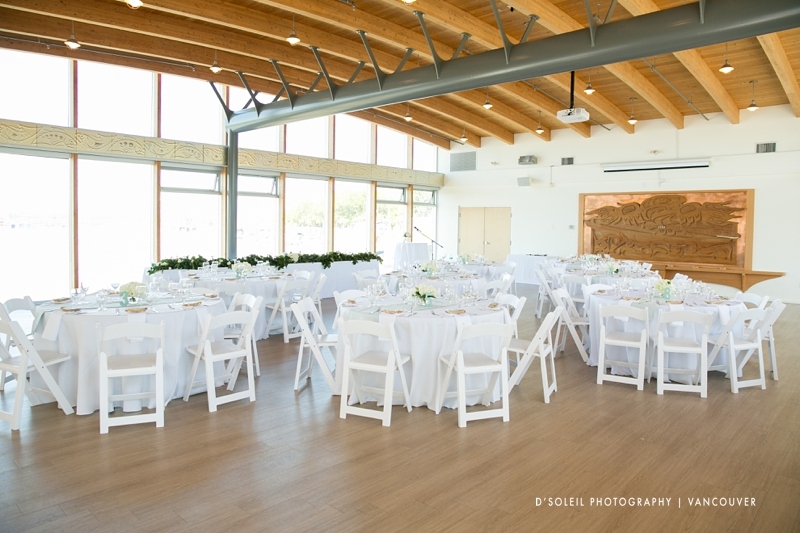 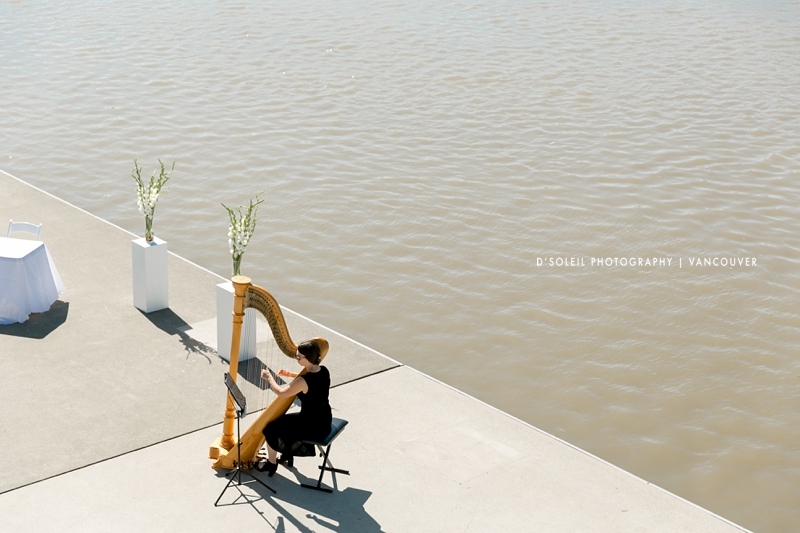 We love the minimalism of this wedding venue. 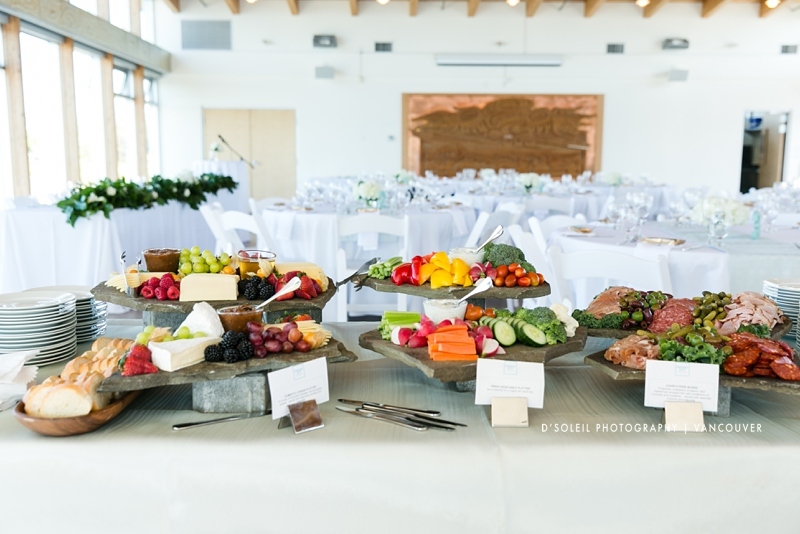 There’s no need to decorate if you don’t want to. 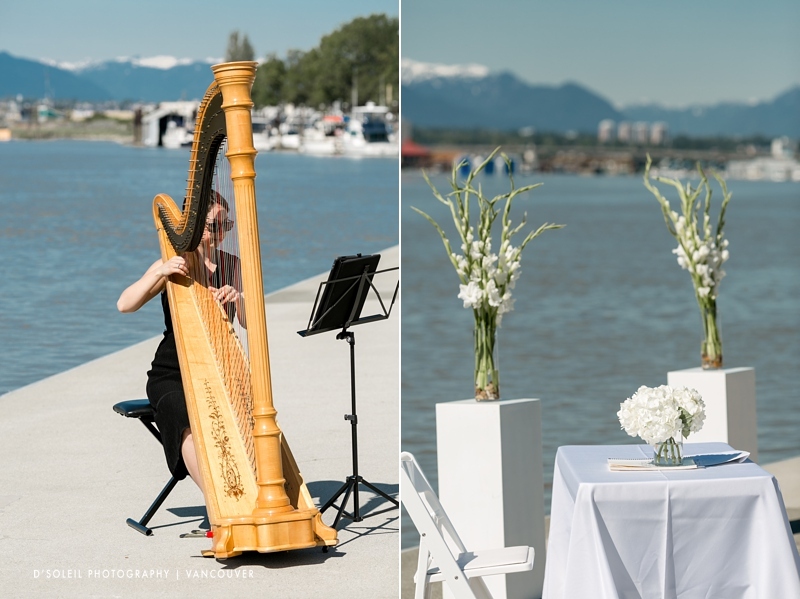 Just let the natural beauty of the outdoors impress your wedding guests. 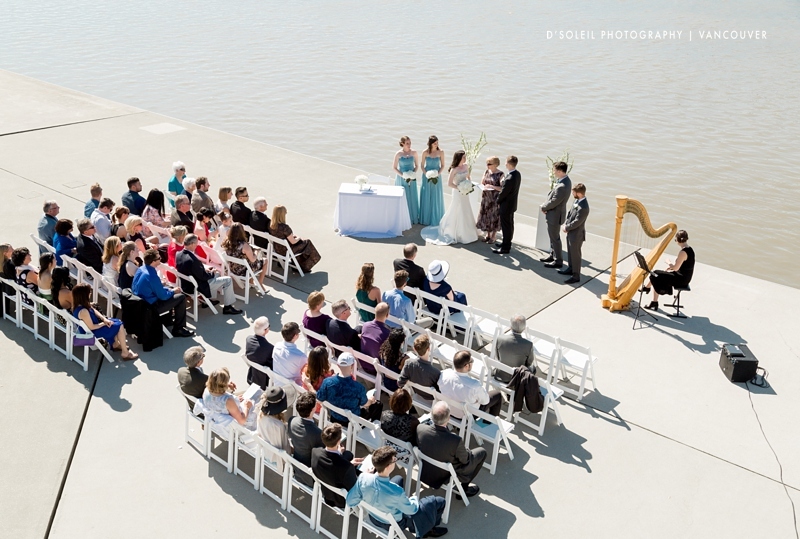 Following the outdoor wedding ceremony, guests were invited indoors in the reception space for drinks and canapés while the family photos were taken outdoors. 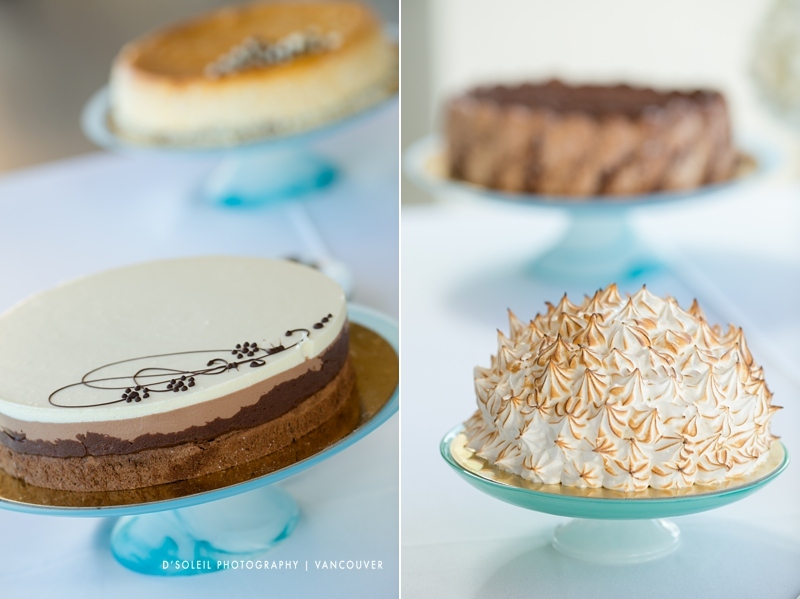 Instead of a single wedding cake, they had multiple cakes for guests to enjoy. 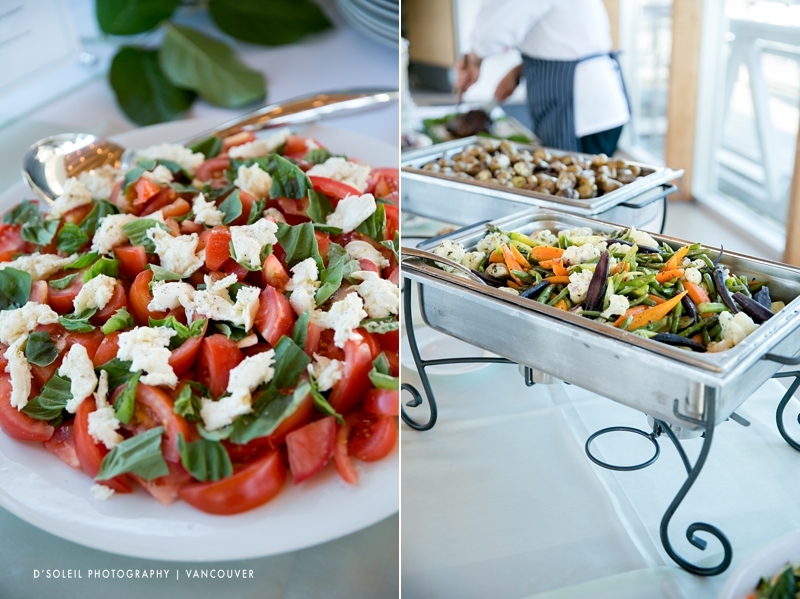 The caterers did a fantastic job displaying the buffet for wedding guests. 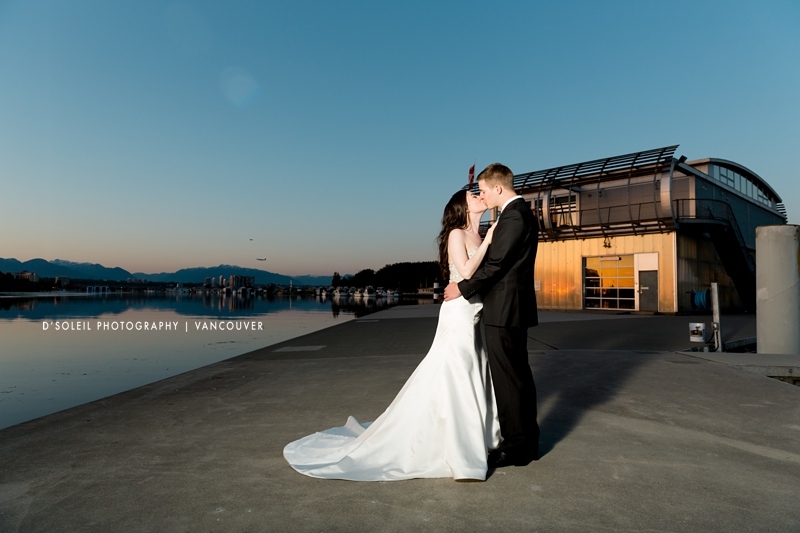 In the evening, we took a short stroll outdoors for photos as the sun set on another beautiful wedding day in Vancouver.